30 Kwara communities in Ilorin protest 6 months of power black out by IBEDC – Royal Times of Nigeria. 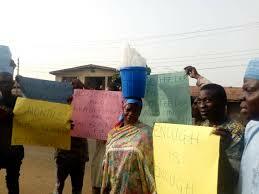 Thirty communities in Ilorin, Kwara state capital today staged a peaceful protest over total blackout being experienced in the affected communities over the last months. They said the last time they were supplied power by Ibadan Electricity Distribution Company, IBEDEC in the affected communities was on November 20, 2018. 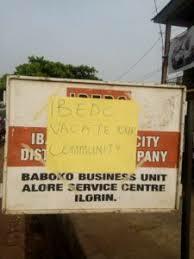 As early as 7: am, scores of members of the affected communities besieged the Oloje undertaking office of the Ibadan Electricity Distribution Company (IBEDC,) located in front of Oloriegbe compound. Spokesman of the protesters Moshood Abdulkadir decried the continued operation of the company in the areas without anything to show for the communities in terms of service delivery and regular supply of power. He lamented the continued sufferings of residents of the affected communities when other communities in the state capital are enjoying power supply, a development he described as no longer unacceptable. When contracted, an official of IBEDEC in, Ilorin, said efforts were on top gear to solve the problem. The official added that the management of the company has held a meeting with representatives of the communities where they briefed them on the level of progress made so far, adding that the company has taken delivery of the equipment to be installed to restore power to the affected areas.